Over 2,000 flights have been grounded - many in the Washington, D.C., area - as a winter storm moves through the Midwest, Mid-Atlantic and Northeast Wednesday. Schools in Baltimore, Philadelphia and Omaha are all closed for the day and federal offices in D.C. are shuttered. 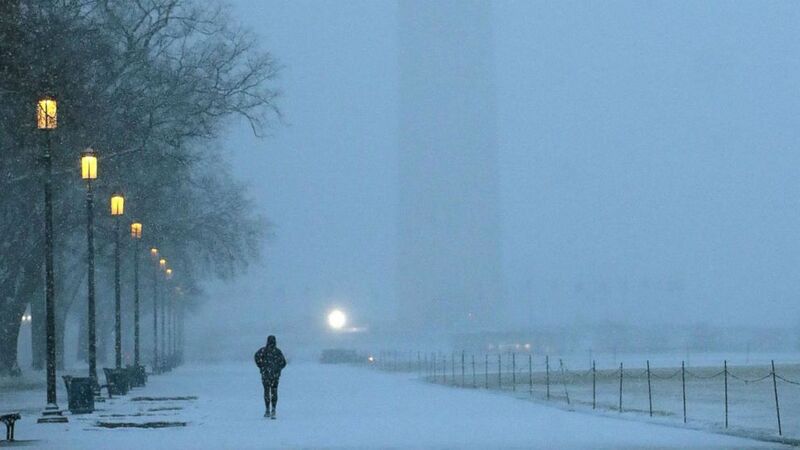 The snow began in D.C. as drivers hit the roads for their morning commutes. The Virginia State Police said its troopers responded to 380 crashes and trapped cars as of rush hour Wednesday morning. D.C.'s Reagan National Airport saw over two inches of snow while the Baltimore airport in Maryland and Dulles International Airport in Virginia recorded over four inches. D.C.'s snow is transitioning to sleet and rain over the afternoon. As the storm crept up the coast it brought snowfall to Philadelphia, where up to three inches is possible, and New York City, which is expecting four inches. Boston will see a burst of snow followed by rain overnight, with only scattered showers for the morning commute. The storm will move out Thursday morning leaving lingering snow across northern New England. In the Midwest, snow fell through the morning in Minnesota, leaving some roadways in the Twin Cities buried under eight inches of snow. With over 30 inches of snow so far, Twin Cities residents are seeing their snowiest February on record. Meanwhile, in the South, heavy rain is falling from Mississippi to Kentucky, potentially bringing dangerous flooding. Nashville may see its wettest February on record. ABC News' Chad Murray, Amanda Maile and Christine Theodorou contributed to this report.